As a child, I often accompanied my dad to his chiropractic appointments. It was interesting to watch the chiropractor, and I often asked questions about how chiropractic worked. Then, during high school, I completed a research project about chiropractic. I also became a chiropractic patient, and that’s when I discovered the benefits of chiropractic for myself! I was an active child and competed in gymnastics at a high level. I learned that my spine was quite misaligned from all of the falls and stress I had put on my body. However, I was encouraged and amazed that chiropractic could help me understand my body better, solve the root causes of my pain, and not only treat my injuries, but help prevent them from occurring again. I appreciated learning how the human body and all its systems were designed to work together, and I enjoyed how chiropractic could help enhance my performance both in and out of the gym. 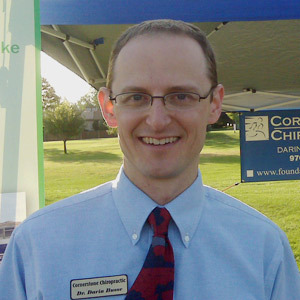 After graduating from the University of Northern Colorado with a Bachelor of Arts in Biological Sciences, I attended Northwestern College of Chiropractic in Bloomington, Minnesota. I earned my Doctor of Chiropractic degree in 2000 as well as a Bachelor of Science in Human Biology. During my time in chiropractic school, I loved being surrounded by like-minded individuals who also wanted to learn how to allow the body to heal naturally. I completed my internship at a chiropractic office in Minnesota, and then I eagerly returned to Colorado to complete an externship with the chiropractor I had seen as a child—the one who answered all my questions, kept me aligned so that I could stay active, and encouraged me to join him in this awesome profession! My wife, Tammy, and I have been married since 1996, and we have three active and “well-adjusted” children. In the summertime, we can often be found camping and hiking in the Rocky Mountains or cycling on a nearby path. When the cold weather brings us inside, we can be found gathered around the table for family games or singing hymns as our kids play the piano. My family treasures the time we spend together in church on Sunday. Scripture refers to Jesus Christ as the Cornerstone, and He is indeed the Cornerstone of my life and the foundation of all I do, including being a doctor of chiropractic. I am a member of the Colorado Chiropractic Association as well as the Greeley Chiropractic Association. I enjoy staying active in my community and consider it a privilege to give back to several organizations that make Greeley great! Contact us today to set up your appointment.